It took us years to understand a disease that seems so harmless but is actually devilish. I was afraid for Yazhavendan when he was born. We held our breath until he turned a year old. Just when we thought he was perfectly healthy, diarrhea began. Imagine if whatever your child eats or drinks comes out the other end in just a few seconds, and throughout the day he continues to poop even though he is not eating. Yazha is dying because this disease is literally draining the life out of him. 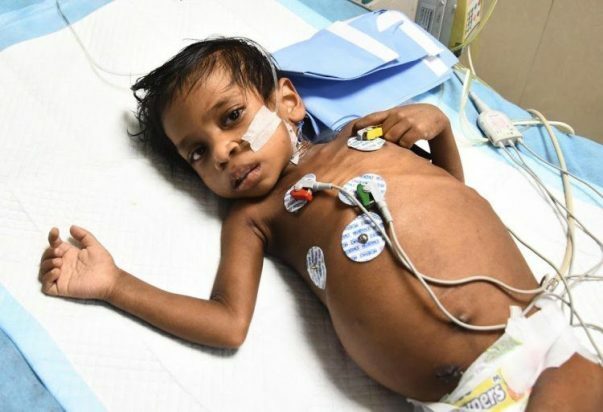 He is only 3 years old, and only an intestinal transplant can save him. Lakshmi and I have been going through this nightmare for 6 years now. Our first child, Ezhil, was just 11 months old, when he died. We could not even process what happened; we were in shock. 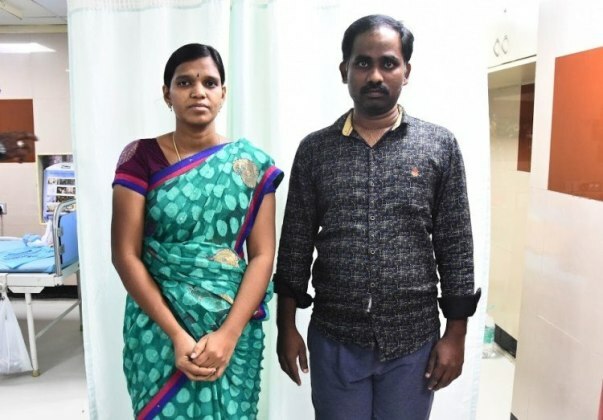 We did not even imagine that our second child, Rithika, would fall victim to the same disease. She had just turned 1. God took her from us. 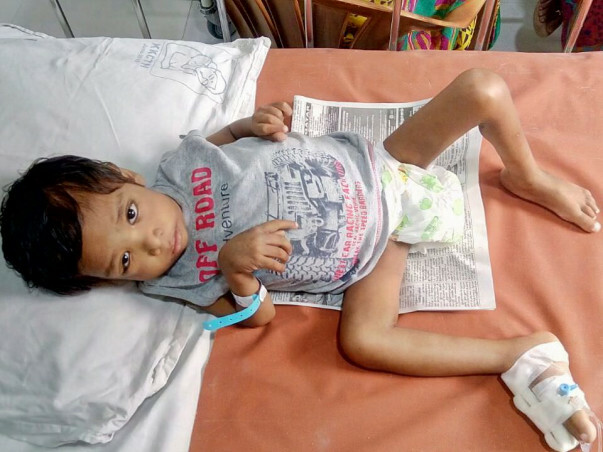 On the day of his second birthday, Yazha had severe diarrhea. Like his brother and sister, he needed hospitalization every few days. We have tried our best to save him. So many needles have hurt this little body. We finally understood what has been happening. 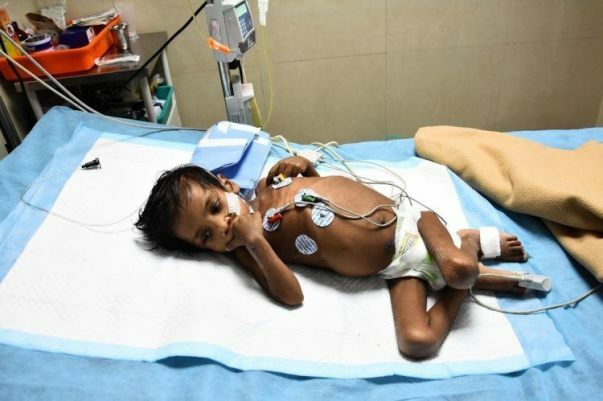 He has primary intestinal lymphangiectasia, a rare disease (not rare for my family, I guess), in which the lymph vessels of the small intestine are enlarged. So lymphatic fluid leaks into his gut. He cannot absorb proteins. Yazha is too weak for surgery. He needs an intestinal transplant. First, he needs nutritional rehabilitation. He cannot even walk, sit or even breathe. He has been in the ICU for over a month now. We have to make him strong enough for the surgery. So he needs to be in the hospital and get nutritional treatment. I sold everything I had, am neck deep in debt, lost two children and am now trying to save my third. I hope this time fate won’t be so cruel to us. I can’t imagine living without him, we have nothing to hold on but to you as our last hope. - Vel Murugan. Your contribution can help these parents from losing another child to this terrible disease. With inexplicable grief, we're having to inform to you that baby Yazhvendhan passed away. His body could not endure the stress and started giving up. He was responding well to the treatment being given to him and was recovering until he developed a fungal infection in the liver. Treatment for the same was going on but eventually, he stopped responding. We appreciate all the support you have shown towards this little boy so far. 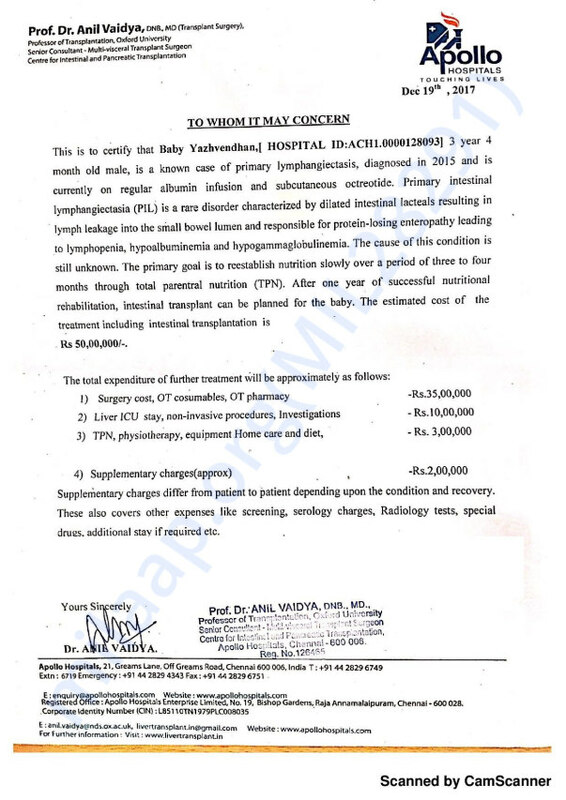 All the funds raised through the campaign have been utilised towards his treatment so far. Please pray for his family. May his soul rest in peace. 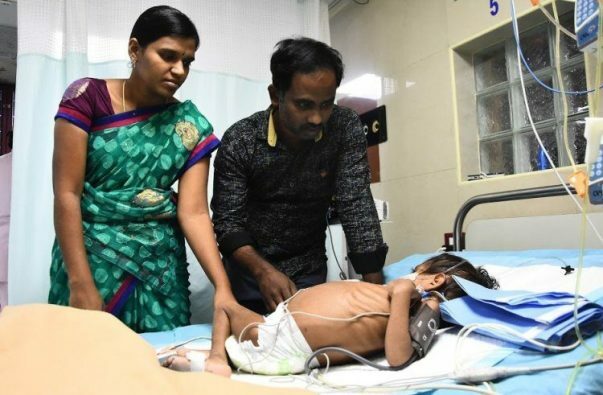 Baby Yazhvendhan is suffering from Sepsis( Fungal Infection) in the liver. He is on 24 hours monitoring and intensive treatment in the Paediatric ICU. He is not stable and currently cannot be transplanted until he recovers from infection and is on Anti-fungal treatment. Please continue to pray for him. 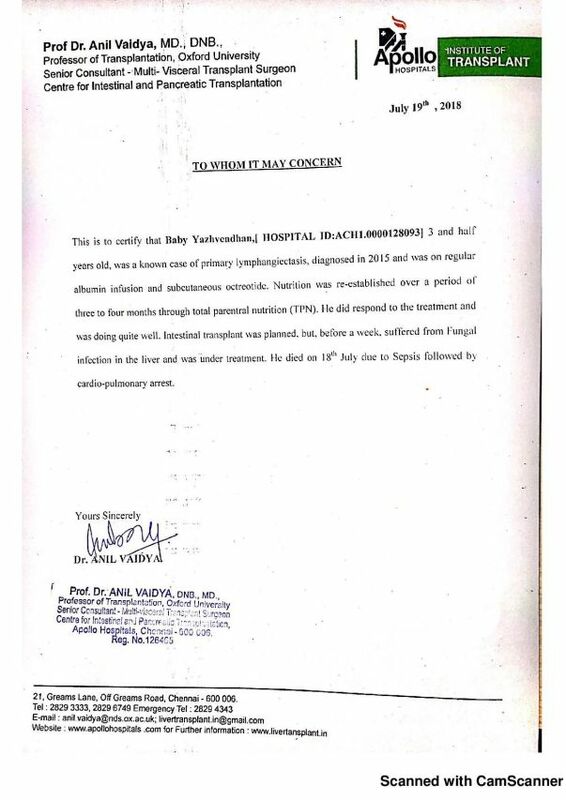 Here is a quick update on Baby Yazhvendhan's health. 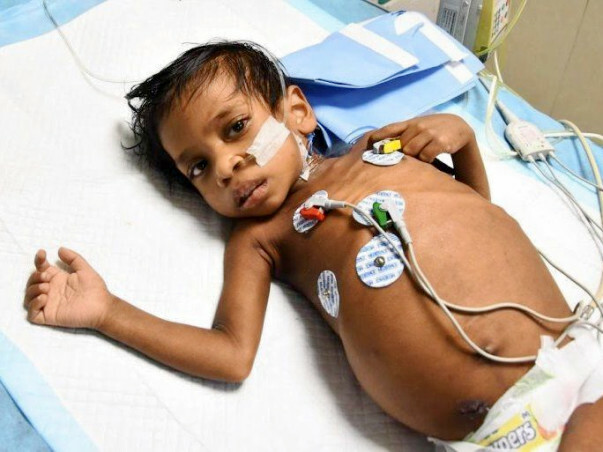 Baby Yazhvendhan suffered multiple infections due to the catheter line but he had gradually recovered now. He is currently stable and he is on total parental nutrition. The baby has attained the weight of 10 kgs which is a good sign of progress. Will keep you posted with further developments.